Operations management refers to a specific field in management which is more concerned about overseeing, controlling and designing production processes while also redesigning business operations during the time when you produce goods and services. It is mainly concerned about ensuring that the operations of your business are efficiently managed, supervised and monitored with the help of effective resources. Operations management is also concerned about making sure that you meet the requirements of customers. A certified operations manager is responsible in the management of that specific process which works in converting inputs that usually come in the form of labor, energy and materials into outputs that usually come in the form of products and services. The highest-ranking officials and professionals in the field of operations management are more concerned about shaping strategies and revising them and formulating tactical decisions that are capable of supporting the process of executing strategies. Operations management can also be defined as a process which is more concerned about managing and directing technical and physical functions of a business organization especially those that are mainly related to production, manufacturing and development. Programs that are developed in this field are usually composed of instruction in general management principles, plant management, industrial labor relations, production control, equipment maintenance management, systems analysis, materials planning and operating production and manufacturing systems. If you want to achieve success when implementing operations management, then you have to make sure that you have a stronger background and knowledge about technology, creativity, people skills and rational analysis. If becoming a certified operations manager is one of your major goals, then be aware that you can take up an operations management certification program which is now introduced by Brainmeasures. Brainmeasures is popular for being one of the best online certification courses providers so you have a guarantee that its operations management course is filled with the most relevant, accurate and updated information about operations management. By taking part in this online certification program, you will get the opportunity to access the company’s operations management training which is guaranteed to work in strengthening your knowledge about all the concepts, aspects, tools and strategies associated to implementing the whole operations management process. You can also expect it to work in your attempt to receive a clearer explanation about your roles and responsibilities as soon as you start working as an operations manager. The skills, knowledge and expertise that you will receive from this company makes you worthy to become one of the recipients of the operations management certificate. 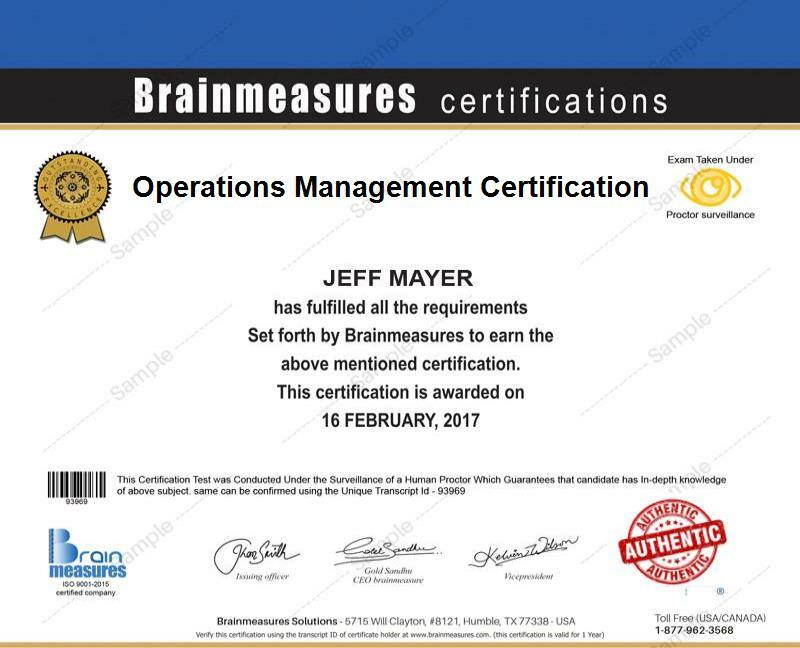 Hundreds of professionals are going to receive numerous benefits from taking part in the operations management certification program available at Brainmeasures. You can expect this certification course to offer more benefits to business owners, managers, chief executives, middle level and senior managers and any other individuals and professionals who are in charge in smoothly running and managing the daily operations of a business organization. You will also enjoy a significant increase in the level of your salary if you are already a holder of an operations management certification. Your operations management certification can be your ticket towards grabbing the position of an operations management consultant which offers an average annual salary of $60,000. Your certification is also a huge help in your attempt to work as an operations manager which allows you to generate around $62,000 to $112,000 yearly.